You are here: Home / News / Foodie Destinations Launched Today! Does your town or region have what it takes to be the ultimate foodie destination of 2018? Applications for Foodie Destinations launched today, June 14th. This year, not only will there be a ‘Foodie Destination’ winner, there will also be the addition of a new category ‘Foodie Town’. Communities across the country are urged to get involved and work with local businesses, foodie groups, Chambers of Commerce and other working groups to submit their applications and promote their area to both local people and visitors. Applications for Foodie Destinations, an initiative by the Restaurants Association of Ireland, will be launching today, June 14th. The programme celebrates Ireland’s unique and wonderful food offering while encouraging local food tourism initiatives across the country. 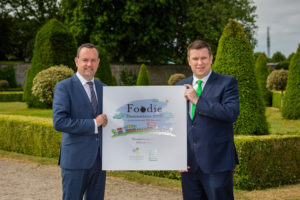 The Foodie Destinations 2018 competition will see towns, villages, regions and communities from all over the country battle it out to be named Ireland’s top destination for a foodie experience. The winner will be a destination that actively promotes itself through joint promotional activities such as food festivals, gourmet trails or farmers’ markets, as well as great dining experiences for locals and visitors alike. They will have established a local producer/supplier network which is utilised and promoted by local businesses. Plans for future growth and investment into the food and hospitality industry at a local level will also be taken into consideration by the judges. Education, training, development and employment will be key components of the ultimate foodie destination. This year, not only will there be a ‘Foodie Destination’ winner, there will also be the addition of a new category ‘Foodie Town’. This new category refers to both towns and villages. Tourism or vacationing should be a primary component of the local culture and economy. These towns offer a stand-alone, unique food and tourism visitor experience which does not expand out to the surrounding areas. Communities across the country are urged to get involved and work with local businesses, foodie groups, Chambers of Commerce and other working groups to submit their applications and promote their area to both local people and visitors. There are 10 finalists, chosen from the applicants, who will receive a visit from our judges. Online voting will also take place this year which counts for 50% of the overall score. Collaboration is vital for the success of any community-based project and will mean the difference between the winner and runners-up of the ‘Foodie Destinations 2018’ competition. The more people that work together on this project, the greater the potential for prosperity and progress. Does your town or region have what it takes to be the ultimate foodie destination of 2018? considered as there are so many different areas within which could qualify. The Burren – although considered a large region – does qualify because they work together to market themselves as a singular food destination. Their small towns and villages are spread out over the sparse landscape but offer the same values when it comes to food tourism and use of the land. A minimum of three groups/organisations/businesses are required to submit one application together. It is important that a collaborative effort is made from a variety of representatives of the destination. An application should not solely represent the efforts/views/interests of just one party, business or individual. Applicants can include anyone from business owners to county councillors, festival organisers, market stall holders, community groups etc.